On the last Sunday afternoon in March, Mike Hughes, a sixty-two-year-old limousine driver from Apple Valley, California, successfully launched himself above the Mojave Desert in a homemade steam-powered rocket. He’d been trying for years, in one way or another. In 2002, Hughes set a Guinness World Record for the longest ramp jump—a hundred and three feet—in a limo, a stretch Lincoln Town Car. In 2014, he allegedly flew thirteen hundred and seventy-four feet in a garage-built rocket and was injured when it crashed. He planned to try again in 2016, but his Kickstarter campaign, which aimed to raise a hundred and fifty thousand dollars, netted just two supporters and three hundred and ten dollars. Further attempts were scrubbed—mechanical problems, logistical hurdles, hassles from the U.S. Bureau of Land Management. Finally, a couple of months ago, he made good. Stuff was leaking, bolts needed tightening, but at around three o’clock, and with no countdown, Hughes blasted off from a portable ramp—attached to a motorhome he’d bought through Craigslist—soared to nearly nineteen hundred feet, and, after a minute or so, parachuted less than gently back to Earth. Hughes converted fairly recently. In 2017, he called in to the Infinite Plane Society, a live-stream YouTube channel that discusses Earth’s flatness and other matters, to announce his beliefs and ambitions and ask for the community’s endorsement. Soon afterward, The Daily Plane, a flat-Earth information site (“News, Media and Science in a post-Globe Reality”), sponsored a GoFundMe campaign that raised more than seventy-five hundred dollars on Hughes’s behalf, enabling him to make the Mojave jump with the words “Research Flat Earth” emblazoned on his rocket. To be clear, Hughes did not expect his flight to demonstrate Earth’s flatness to him; nineteen hundred feet up, or even a mile, is too low of a vantage point. And he doesn’t like that the mainstream media has portrayed things otherwise. This flight was just practice. His flat-Earth mission will come sometime in the future, when he will launch a rocket from a balloon (a “rockoon”) and go perhaps seventy miles up, where the splendor of our disk will be evident beyond dispute. If you are only just waking up to the twenty-first century, you should know that, according to a growing number of people, much of what you’ve been taught about our planet is a lie: Earth really is flat. We know this because dozens, if not hundreds, of YouTube videos describe the coverup. We’ve listened to podcasts—Flat Earth Conspiracy, The Flat Earth Podcast—that parse the minutiae of various flat-Earth models, and the very wonkiness of the discussion indicates that the over-all theory is as sound and valid as any other scientific theory. We know because on a clear, cool day it is sometimes possible, from southwestern Michigan, to see the Chicago skyline, more than fifty miles away—an impossibility were Earth actually curved. We know because, last February, Kyrie Irving, the Boston Celtics point guard, told us so. “The Earth is flat,” he said. “It’s right in front of our faces. I’m telling you, it’s right in front of our faces. They lie to us.” We know because, last November, a year and a day after Donald Trump was elected President, more than five hundred people from across this flat Earth paid as much as two hundred and forty-nine dollars each to attend the first-ever Flat Earth Conference, in a suburb of Raleigh, North Carolina. The unsettling thing about spending two days at a convention of people who believe that Earth is flat isn’t the possibility that you, too, might come to accept their world view, although I did worry a little about that. Rather, it’s the very real likelihood that, after sitting through hours of presentations on “scientism,” lightning angels, and nasa’s many conspiracies—the moon-landing hoax, the International Fake Station, so-called satellites—and in chatting with I.T. specialists, cops, college students, and fashionably dressed families with young children, all of them unfailingly earnest and lovely, you will come to actually understand why a growing number of people are dead certain that Earth is flat. Because that truth is unnerving. The November conference was held in a darkened ballroom of an Embassy Suites near the Raleigh airport. Dozens of rows of chairs had been set out and nearly all were filled. To my right, a young couple with a stroller listened intently; a man in front of me wore a T-shirt with the words “They Lied” across the back. Onstage, Marble recounted his awakening. Marble is African-American and was one of a handful of people of color in the room. He had enlisted in the Army and gone to Iraq after 9/11; when he returned home, to Arkansas, he “got into this whole conspiracy situation,” he said. Marble found the light in his YouTube sidebar. While looking for videos related to “Under the Dome,” a TV sci-fi drama, he came across “Under the Dome,” a two-hour film, which takes the form of a documentary, by Mark K. Sargent, one of the leading flat-Earth proselytizers. The flat-Earth movement had burbled along in relative darkness until February of 2015, when Sargent uploaded “Flat Earth Clues,” a series of well-produced videos that, the Enclosed World site notes, “delves into the possibility of our human civilization actually being inside a ‘Truman Show’-like enclosed system, and how it’s been hidden from the public.” (Access to those videos and more is available on Sargent’s personal Web site, for ten dollars a month.) It announced itself as “a Reader’s Digest version” of the flat-Earth theory; Marble watched it over and over, all weekend. The flat Earth is the post-truth landscape. As a group, its residents view themselves as staunch empiricists, their eyes wide open. The plane truth, they say, can be grasped in experiments that anyone can do at home. For instance, approach a large body of water and hold up a ruler to the horizon: it’s flat all the way across. What pond, lake, or sea have you ever seen where the surface of its waters curves? Another argument holds that, if Earth were truly spherical, an airplane flying above it would need to constantly adjust its nose downward to avoid flying straight into space. If, say, you flew on a plane and put a spirit level—one of those levels that you buy at the hardware store, with a capsule of liquid and an air bubble in the middle—on your tray table, the level should reveal a slight downward inclination. But it doesn’t: the level is level, the flight is level, the nose of the plane is level, and therefore the surface of Earth must be level. Marble performed this experiment himself, recorded it, posted it on YouTube, and a co-worker started a Reddit thread that linked to it. Soon Marble had twenty-two thousand followers and a nickname, the Spirit-Level Guy. Rowbotham’s ideas gained traction, and when he died, in 1884, his followers formed the Universal Zetetic Society. It published a magazine, The Earth Not a Globe Review, that decried the teaching of astronomy to schoolchildren, ridiculed evolution, and entertained alternative theories, including the possibility that Earth is a cube. And it developed a base in the United States; until the nineteen-forties, the town of Zion, north of Chicago, followed a strict religious code that embraced a flat-Earth doctrine. The Universal Zetetic Society sputtered out but was revived under different names over the years—in 1956, 1972, and 2004. The core model remained largely unchanged from Rowbotham’s day, although it was updated to account for space travel and other mid-twentieth-century fictions. 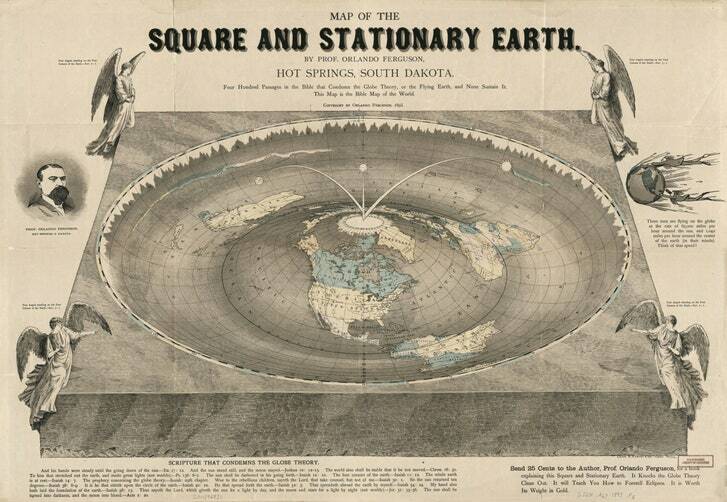 A map from 1893 portrays Earth as square and stationary and warns of Biblical interdiction against the notion of a round Earth flying through space. I encountered Robbie Davidson, the organizer of the conference, in a corridor outside the ballroom. Davidson is the director and sole employee of Kryptoz Media, a company based in Edmonton, Canada. He is tall and sharp-featured, and when he speaks his sentences spill into one another. He told me that he was turned on to the flat-Earth scene in 2015; before that, Kryptoz was marketing cryptocurrencies to everyday consumers. He described the modern flat-Earth community as a confluence of three strains of thought. “There’s the conspiratorial,” he said. “It’s like, ‘That’s kind of weird with the moon landing. Maybe I’ll look into it. What else could they be lying about?’ ” The second is “the scientific-minded,” people who “just want to go out and do the experiments.” The third, Davidson said, “is the spiritual—people that want to say, ‘Wait a minute, what would happen if I took the Bible literally?’ ” In style and substance, the flat-Earth movement is a close cousin of creationism. At the end of the conference, Davidson would be screening his new documentary, “Scientism Exposed 2,” which dismisses dinosaurs, evolution, gravitational waves, and a spherical Earth as part of a broad agenda “to hide the true creator of Creation,” according to the trailer. Here are some reasons why you may think that Earth is actually a rotating sphere. For one, some of the ancient Greeks said so: if the moon is round, Earth must be, too (Pythagoras); as you move north or south from the equator, you see a changing array of stars and constellations (Aristotle); you can calculate Earth’s circumference by comparing the lengths of the shadows of two tall sticks placed many miles apart (Eratosthenes). More recently, we’ve noticed that solar noon—the point in the day when the sun is highest—doesn’t happen everywhere on Earth at the same time. (Time zones were invented to address this dilemma). Also, the higher you climb in elevation, the farther into the horizon you can see; if Earth were flat, you’d see an equal distance—to the edge of the world, with a strong enough telescope and an unobstructed view—regardless of altitude. Human engineering seemingly takes Earth’s curvature into account. Lighthouses are deliberately built tall so that their beams can be seen from ships far away, over the intervening curve of sea. Radio towers send their signals dozens or hundreds of miles by bouncing them off the ionosphere, which wouldn’t be necessary if Earth were flat. A long bridge appears flat because its span parallels Earth, but its supports betray the curvature; the towers of the Verrazano-Narrows, in New York, are more than an inch and a half farther apart at the top than at the bases. And, of course, we have photographic evidence of a globular planet—millions of examples since the nineteen-fifties, taken by spacecraft and orbiting satellites. Of course, such arguments prompt further questions. If Earth is actually flat, why does the sun rise and set? Where does it go at night? If it’s true that the sun and the moon never actually dip below the horizon but instead travel in wide circles around the North Pole, what keeps them aloft? And what about all those satellites I’ve seen being launched into space? “Facts are not true just because they’re facts, if that makes any sense,” Jeran Campanella, who soon followed Marble to the stage, told the audience. Campanella is in his late thirties, with a serious face and a close-shaved head. Like Sargent, he gained prominence through a series of YouTube videos exposing the round-Earth hoax, although he has personalized the flat-Earth outlook by labelling it “Jeranism.” (“No, it is not a religion,” his Web site notes. “It is simply my name with ‘ism’ added at the end.”) His video presentation had glitched out, so he worked from his notes, reiterating the movement’s core belief: ninety-nine per cent of received wisdom is questionable; if you can’t observe it for yourself, it can’t be trusted. “It simply comes down to, Have you been there? Have you been to Saturn? Have you been to Jupiter?” Campanella said. To insiders, the message is empowering. Trust in your senses. Don’t accept the word of a talking head. (Set aside the paradox of a man onstage imploring his large audience to ignore him.) “We all live in the world; we can see what’s real and what’s not,” Campanella said. “Science is really an excuse for people to be stupid.” Mike Hughes, the rocket builder, told the A.P. in November, “I don’t believe in science. I know about aerodynamics and fluid dynamics and how things move through the air. But that’s not science, that’s just a formula.” The conference audience was frequently encouraged to “do your own research,” which mostly seemed to involve watching more YouTube videos and boning up on Scripture. When I reëntered the ballroom, the audience was watching a short documentary that managed, within two minutes, to mention norad, the Pentagon, the falsehood of evolution, nasa, the 9/11 hoax, George W. Bush, and Stephen Hawking. (“Do you really believe he’s had A.L.S. for fifty-three years?”) I had already heard references to other well-known conspiracies—Pizzagate; Sandy Hook; the mass shootings in Las Vegas, Paris, and Orlando. One attractive aspect of the flat-Earth theory, it seemed, was that it served nicely as an umbrella for all the other coverups. “It’s the mother of all conspiracies,” more than one person told me. Many things, the flat-Earthers understand, are being hidden. God, of course. Also, beyond the Antarctic ice wall lie thousands of miles of land—“an America 2.0,” one speaker said—that powerful people are keeping to themselves. Onstage, Mark Sargent had suggested that the world was run by “a small, scary group of smoking men sitting around a table.” nasa, meanwhile, is hoarding billions of dollars in taxpayer money for its operations, which include guarding the ice wall with armed employees and paying frizzy-haired actors to pretend to float in zero gravity. The astronauts are Freemasons, sworn to secrecy. The other workers, the engineers and functionaries, have either been duped or don’t want to speak out, for fear of losing their jobs. At five-thirty, the conference broke for the day and the crowd spilled out into the hotel atrium for happy hour. I needed a drink, and, to my surprise, Evangelical flat-Earthers sometimes do, too; many had gravitated, or perhaps simply fallen, toward the bar, where they talked excitedly among themselves and ate pretzel snacks. Several of the speakers, including Sargent and Campanella, were surrounded by admirers who were seeing them for the first time in person. The atmosphere was convivial, like a class reunion. “It’s a big family,” a man named Ben Campbell told me. He gestured toward the hotel restaurant across the atrium: “I could walk into there and sit down with anyone!” Campbell was from Las Vegas and wore a name tag that read “Ben from Vegas.” In Vegas, Campbell organizes a weekly flat-Earther meetup at a local bar. There are flat-Earth meetups in cities around the country; the one in Denver, where the next Flat Earth Conference will be held, is particularly active. The Vegas chapter draws about three dozen people and the number has been growing, Campbell said; for many, it was the one place where they felt comfortable expressing their ideas. Believing in a flat Earth is hard work; there is so much to relearn. The price of open-mindedness is isolation. “It took me about four months before I could talk to someone outside the apartment about this,” Marble said during his presentation. “You’ve gotta be ready to be called crazy.” Several people described the relief of “coming out” as a flat-Earther. “You can tell people you’re gay, you can tell people you’re Christian, but you don’t get ridiculed like a flat-Earther,” I overheard one woman say. “It’s really that bad.” At the bar, I fell into conversation with a woman who was attending a real-estate conference in the hotel. She asked what my conference was about; when I told her, she doubled over with laughter. I cringed a little, protectively, and glanced around to see if anyone had heard her. You, we, are special. “It’s like God is patting me on the shoulder, saying, ‘You deserve this!’ ” a man from New Orleans told me. He was a trucker, the son of a former newscaster, and an occasional musician. As we were talking, an older man in a wheelchair approached and, in a drawl, introduced himself and asked if we were Christians. He brought up the notion of infinite space and the lack of a creator. “How can people live with that?” he asked. The flat Earth was perhaps a scam, an emotional salve with no basis in physical reality. Now it has become both real and surreal, like a performance-art piece in which nobody can tell the actors, stagehands, and audience apart. “Do you think Trump knows? Do you think he knows that space is fake?” Campanella asked at one point. When I pressed Davidson on whether he truly thinks Earth is flat, he replied, “Well, I don’t know one hundred per cent, but I would say that I’m very sure what it’s not. I definitely do not believe that we’re a spinning ball flying through space.” If nothing else, the flat-Earth community has tapped into a form of mental perpetual motion: if you think it, it must be true. Solipsism is the new empiricism. More than once at the conference, I heard the flat-Earth “debate” depicted as a Biblical confrontation. “This is a struggle between good and evil, the soldiers of light versus darkness,” Marble said. Maybe he’s right. Maybe this is how Lucifer arrives: not in a spotlight but cloaked in fog, creeping in, sowing ignorance and doubt. The devil is in the lack of detail or any regard for it. I must tell you, as a friend, that I agree completely. This article written by By Alan Burdick , originally published at The New Yorker here.